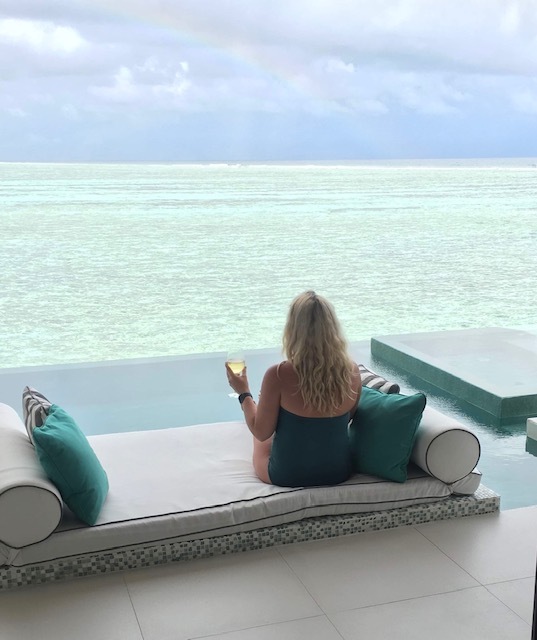 Our experience in the Maldives really lived up to our expectations. The water is next level amazing! All we can say is WOW! 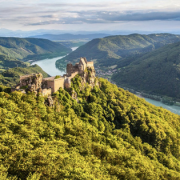 And if you haven’t been, you need to get there!! A 35 min speedboat from Male Airport will take you to Anantara Dhigu. 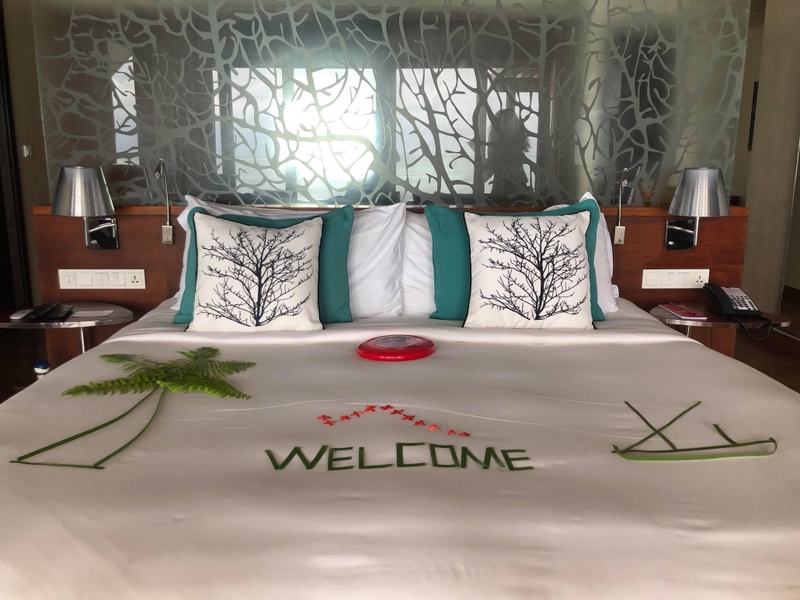 It is then also connected to both Anatara Veli (Adults only) & Naladhu Private Villas. 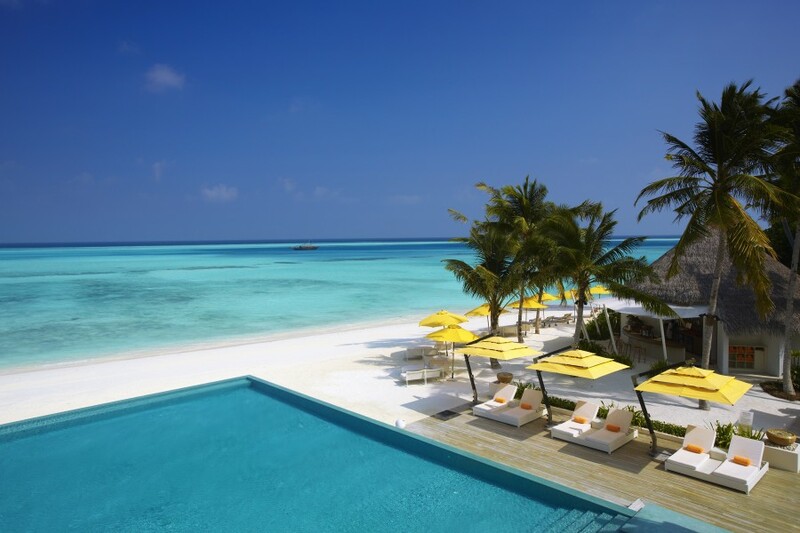 Anantara Dhigu is a small intimate island. Beach villa: The beach villas have recently been refurbished, they are lovely!! They all have direct access to the beach. The beach is stunning and perfect for swimming in. You could easily spend an entire day on the beach and in the water! 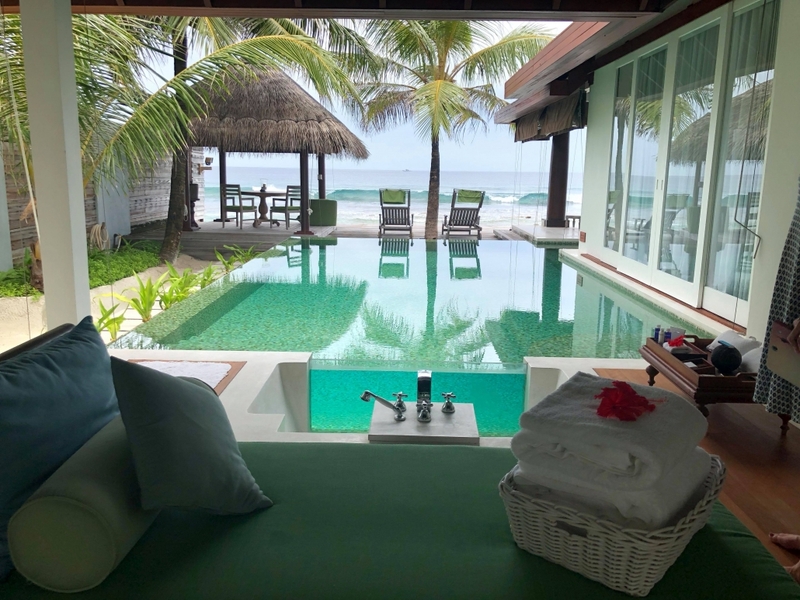 Some of the beach villas have private pools. If you are happy to pay the extra then you should go the plunge pool option. Overwater bungalow: Wow! Just wow!! These are incredible. Perfect for a first time traveller to the Maldives. 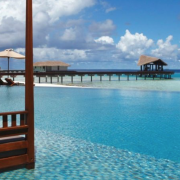 Anantara Dhigu is a great family option for younger families (a kids club is also available). We think families with teenagers would run out of things to do on a longer stay. We loved the breakfast and had dinner at their signature restaurant Salt, Fire Grill which was delicious!! 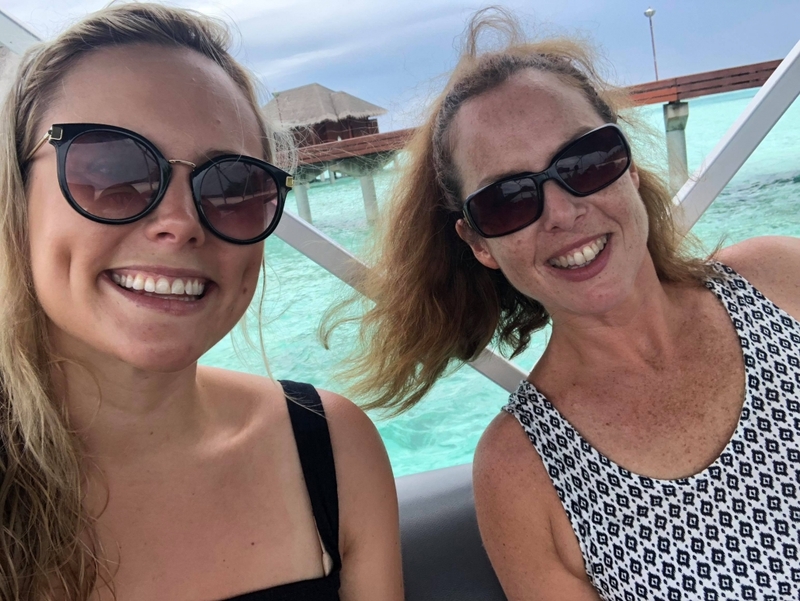 Dolphin cruise (1hr) – ($80USD per person). Certainly worth it! We saw so many dolphins! The day spa on Dhigu is also incredible!!!! Connected to Dhigu by a small boat. Veli is a great alternative if you want to get away from children. 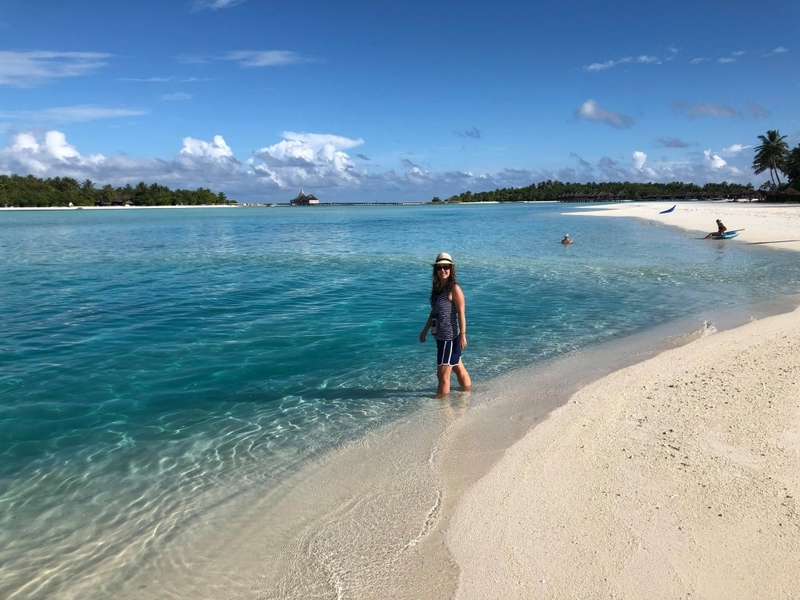 Veli guests can still enjoy Dhigu and adult guests from Dhigu can still go across to Veli. 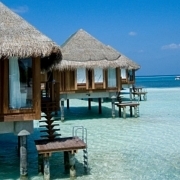 Veli also has the overwater bungalows and beach bungalows, however we preferred the bungalows at Dhigu. You can eat on both islands, which is good as the islands are small so you can mix it up. Veli had a really lovely feel and good ambiance. These are huge! The villas are amazing, very very private. These are for the families or couples who literally do not want to see ANYONE. 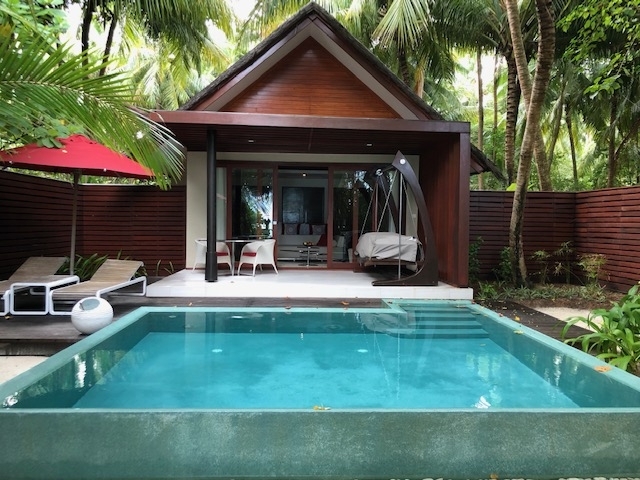 All villas have their own plunge pools and direct access to the beach, they also come with their own butler. 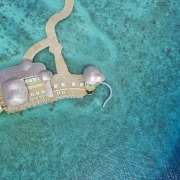 No over water villas on this Island. Naddhu guests can go to Veli & Dhigu at any time, however Veli & Dhigu guests cannot go to Naddhu Villas. It is a good option if you are wanting a very private stay – you literally do not need to leave the villa if you don’t want! 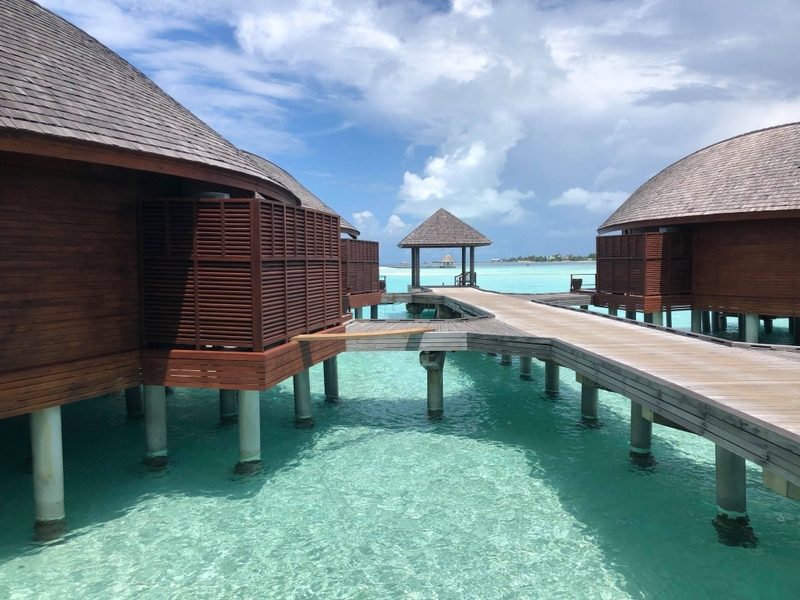 Anantara Dhigu in general was small and felt like a true island resort experience. 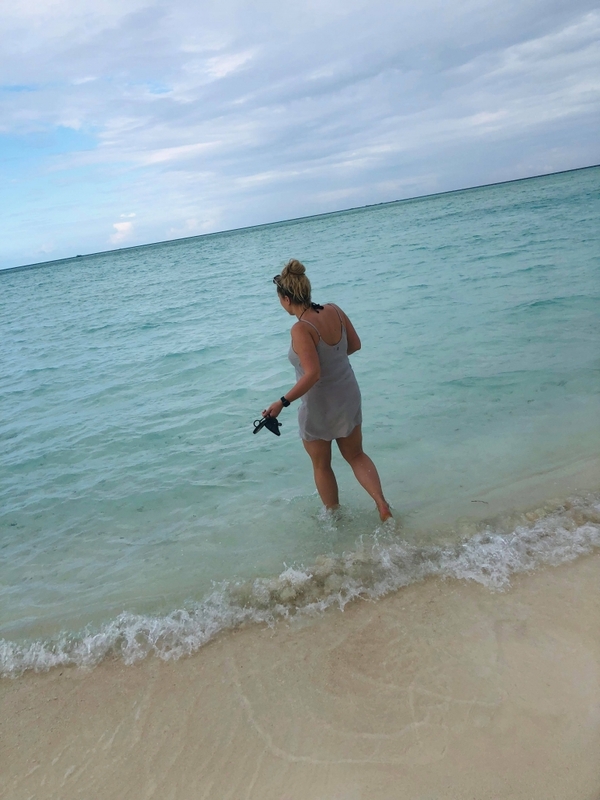 Beaches are beautiful and the resort had a relaxed, homely atmosphere. 35 min sea plane from Male. 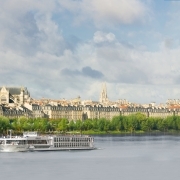 There is also a domestic airport 5 minutes away by speedboat. Great option if you are uneasy on a seaplane. Direct access to the beach and some with private pools. 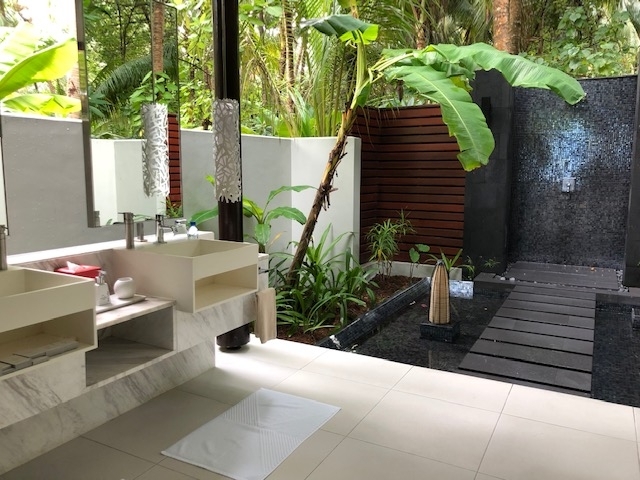 Amazing outdoor bathrooms! I imagine it would be like showering in the jungle. Beach is great and swimmable. Family villa has a separate family room attached – FITS A FAMILY OF 5!! Niyama is really catering towards the families. Kids club up to 11 yo. They also have a program for 12mth- 2years aprox 20usd per hour, capped at $100usd per day. Teenagers have a ‘chill’ area with xbox, pool table, darts, movies. Free snorkelling, paddle-boards & Kayaks. Surf break! There is a surf break off the island. You can go to ‘Surf Shack’ and have a drink while watching people surf. This part of the island feels more like Sorrento back beach than the Maldives. Which is pretty cool. Not what you expect when you go to the Maldives. Resort is large, it was at 90% capacity and didn’t feel it. Tribal – African Cuisine, with a full Africa theme (even served by Africans) Best ribs I’ve ever had!! Nest – Asian Cuisine. Nest is built into the trees. It is one of the most amazing restaurants I’ve been to. You are literally eating in the jungle, unfortunately pictures wouldn’t work as it was too dark. The food was delish too!! Edge – Fine dining. Built on a pontoon. Also has an underwater restaurant and night club. We liked the other two better. Would highly recommend a ½ board option. If we were paying for our dinners they would have exceed $300usd per dinner (not including wine). We really stress the importance of a ½ board option. Dighu has a lovely relaxed feel. Small but didn’t feel too small. Good food & service. 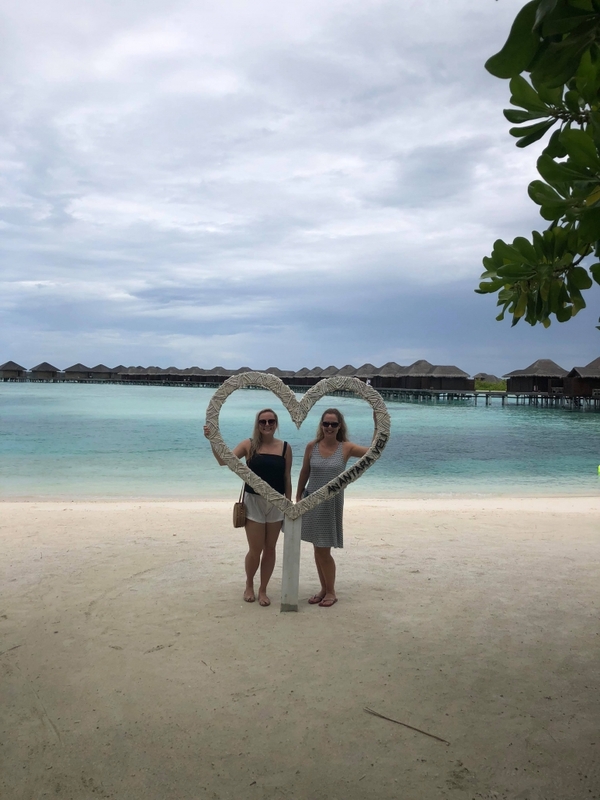 Overwater bungalows were amazing. Perfect for couples or young families. Perfect for a 5-7 night stay. 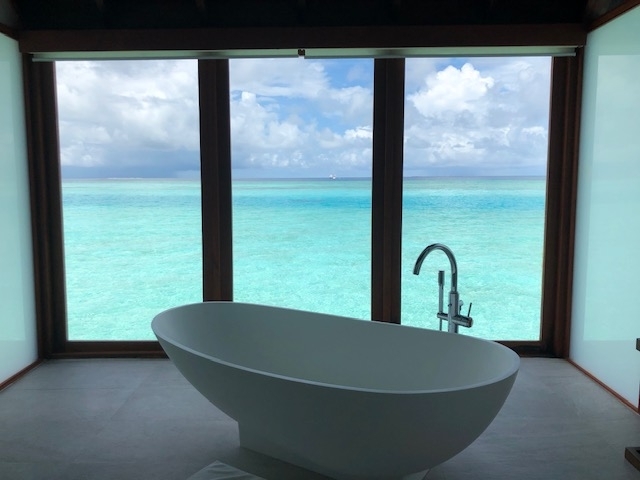 Niyama is a completely different concept. Bigger with more activities and restaurant options. Would be perfect for a 7 night stay. Catering to teenagers aswell as young families. 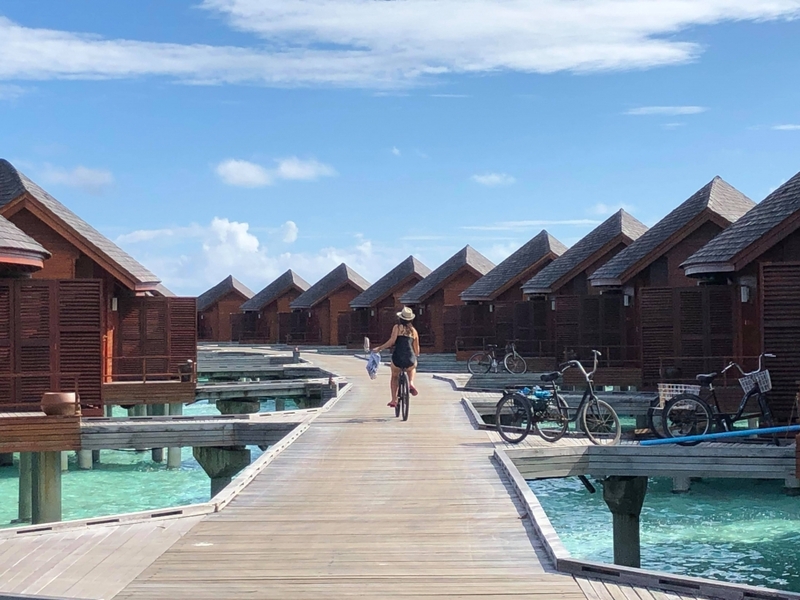 Overwater villa is perfect for a first timer who really want that full experience. However in my opinion I think a beach villa is just as good. Its so nice to be able to walk out of your villa onto the stunning beach. 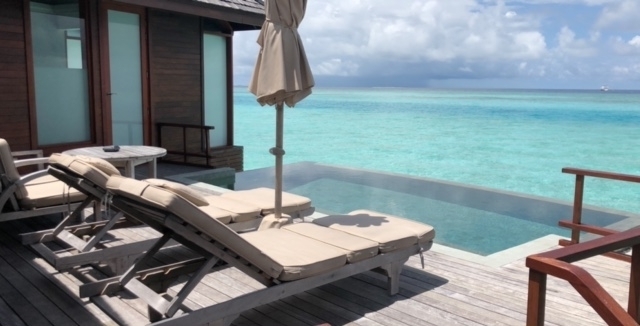 So if your budget doesn’t stretch to an overwater option, I would book a beach villa experience with confidence. On way over we had the old A330. Like other reviews from my colleagues, the seats are uncomfortable. On the way home we had the new A330. Seats were MUCH better! The plane also has WIFI and allows international roaming on your phone. 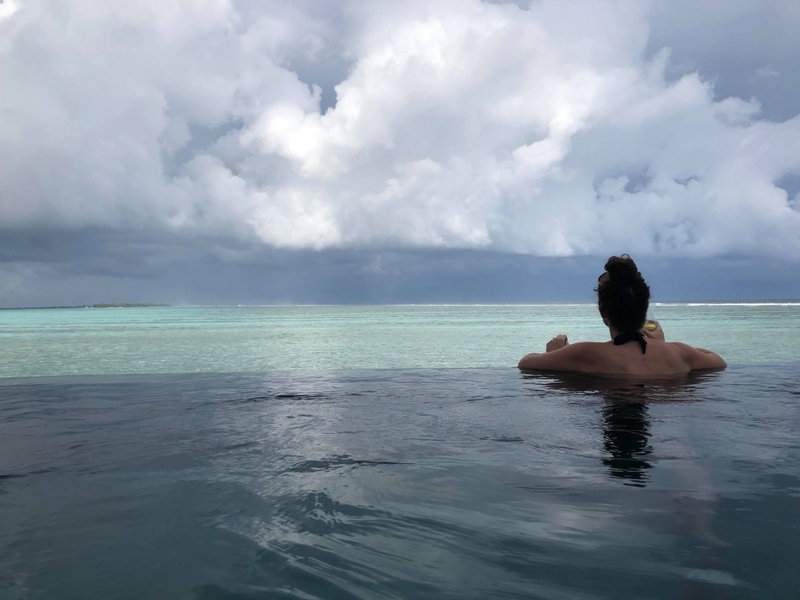 We had one day of rain ALL DAY, although we were happy to hangout in our villa, I can imagine if you had a week of rain it might ruin your experience. 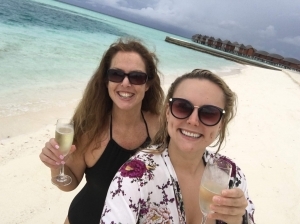 Our experience in the Maldives really lived up to our expectations. The water is next level amazing! All I can say is WOW! And if you haven’t been, you need to get there!!! 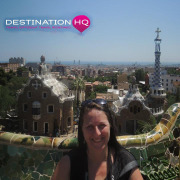 I began my career at 2010 after discovering my passion for travel while living and working in Canada for 2 years. Since then I have travelled to the USA, Mexico, Vietnam, Cambodia, Thailand, Hong Kong, Fiji, Croatia, Italy and New Zealand. I love to experience new things, learn about different cultures and, of course, taste food from around the world. Africa is also one of my favourite destinations I‘ve been to. I’m a Ski Expert and have travelled to Club Med Ski resorts in both France and Japan. 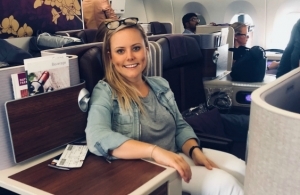 My love for travel developed from growing up in Hong Kong and Singapore – my Dad was based there as a pilot. 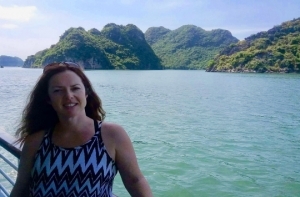 I started working as a travel agent in the 1990’s and travelled extensively through Europe, and more recently through Asia with my young family. A family highlight was 4 weeks in America including Disneyworld and New York. My favourite cities are New York, Prague & Paris. 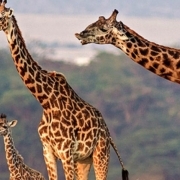 My most amazing trips have been on safari in Kenya and visiting the amazing palaces in Russia. 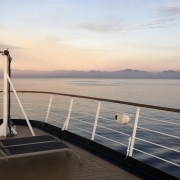 I travelled to Myanmar this year on a luxury cruise and tour which was amazing. My bucket list would be The Kimberley & Patagonia in Chile.